My Quilt is Finally Finished! First of all, don’t forget to enter my sewiversary giveaway. It’s open until Saturday night. Click on the button right there at the top of the sidebar, or go here. OK, on to new stuff. I think this may be my longest sewing work in progress to date. Which isn’t saying much because I haven’t really been sewing that long. My cute mother in law gave me these fat quarters last June and before June was over I had the quilt top done. I’ve had the backing since last July, sewn together and ready to go. And then this sat in my closet for months. Months!!! A few weeks ago my friend Danielle posted some pictures of some of the quilts she’s been working on. (She has a long arm machine at her house (jealous) and is quite the pro. Like seriously.) The pattern she’d been working on was a beautiful feathery thing and I just love how those quilts turned out. (see here) Anyway, I decided right then that I was going to send her my quilt and she was going to finish it. And so I did. And she did. And it is beautiful. I finished putting the binding on this week and I couldn’t be happier with how it turned out! I just love it! It’s the perfect summer weight quilt and I think it is going to get a lot of use these next few months. And did I mention how fast she had that thing cranked out and back in the mail? It was fast. Like, two days fast. I know, she’s amazing. I’m not sure what all of these fabrics are, I know some of them are from moda’s Sweet line, but I’m not sure about them all. The pattern is the Turning Twenty by Tricia Cribbs and it couldn’t be easier. All it uses is fat quarters, and there is very little waste involved. Which I like. Sometimes I think I should have been born 150 years ago because I agonize about throwing away tiny little scrap and bits of thread even. Issues. I know. I bound it with a very cute stripe and the back is that little pink floral. Today after it got washed it spent the day hanging out on the floor in the living room. Creamie loved it, she kept pointing out all the birds and circles (polka dots) and the flowers and stripes. It was adorable. And I am just so glad that it is finished. Thank you so much Sew+Tell, go look at everyone’s stuff, it’s a great way to start the weekend. I’m going to celebrate my weekend by participating in the Race For The Cure with my mother and sisters in law. Creamie is coming with us and it’s going to be a blast. A total girls party for a great cause. Happy Weekending! ← I want to ride a bicycle…. What a beautiful quilt….sometimes a project comes out better when you spend time thinking it all through…I have half finished projects that I have been working on for years and I quite like digging them out once a year and adding a bit more to them…they’re like old friends!! Love your happy quilt. The binding is delightful! Your quilt is really beautiful! Your friend did a fantastic job with the quilting. I LOVE it when I get quilt finished! It is the best feeling! Oh, and I’m all about not wasting too! These are gorgeous fabrics! With that pattern, you can still have big pieces and enjoy the pattern on the fabric. What a beautiful summer quilt you have to enjoy! This is SOOO nice! I love the simple pattern because it really shows off the fabric. Great job! Lovely! I’m a sucker for bright colors and your friend did an awesome job on the quilting. Good luck with your race, (i know it’s not really a race), and it sounds like it’s going to be fun! How exciting about the Race for the Cure, and with family! Those fabrics remind me of the 50s. I have some dishes I’d like to photograph on them. You don’t mind, right? 🙂 Ha! Very beautiful – I bet both you and the quilt are happy to be finished. Wow the quilt is amazing. I need to find some friends with long arm machines!!! Good luck in your race! A joy to look at. This is so pretty! I love those fabrics. Very summery. The prettiest quilt! Love the fabrics and your friend did a fantastic job quilting all those feathers. And in only two days? Amazing all around! super cute! i need a sewing machine! Beautiful quilt, I love that it is made of big pieces so that you can really enjoy each fabric. I hope I can finish my first quilt sometime in the near future too. Those feathers ARE beautiful! 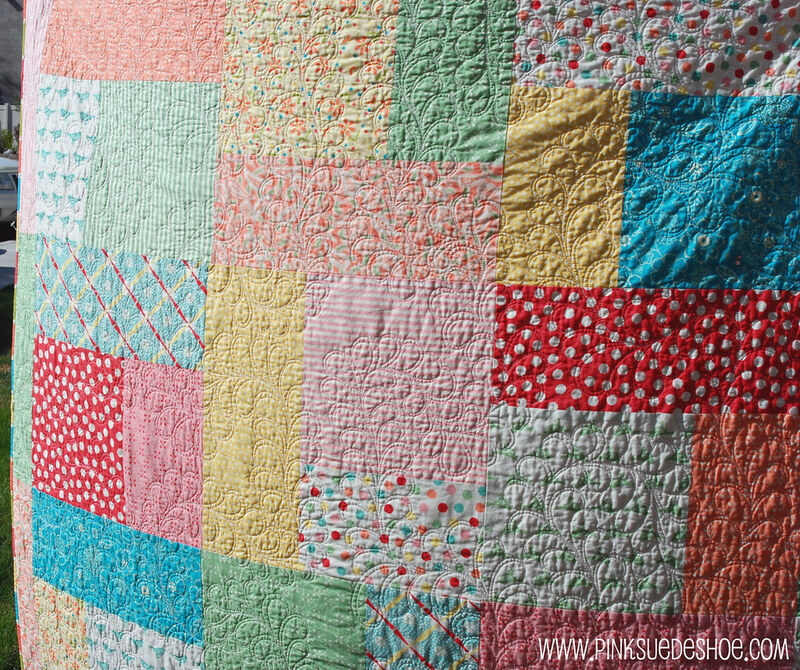 Thanks for sharing such a summery, pretty quilt! Have a great girls weekend! Way to go!!! Awesome first quilt! Are you hooked to that crinkly lovliness? Hope so! 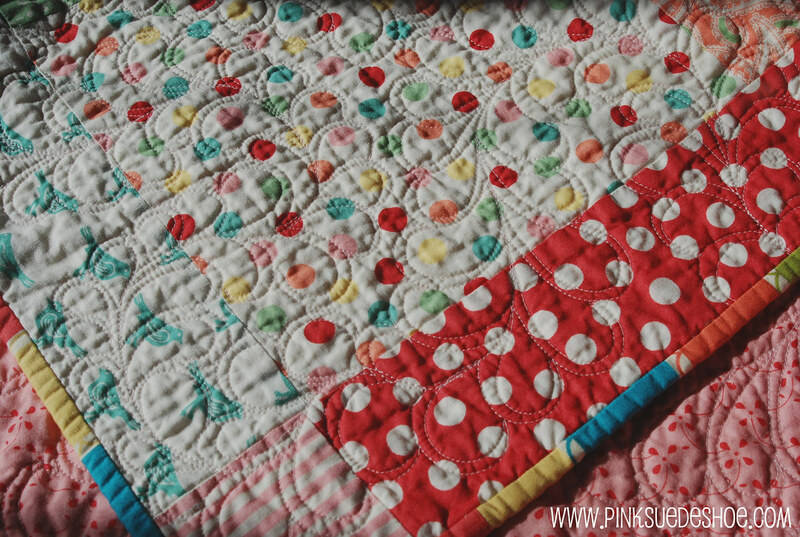 That is a gorgeous quilt – I love the big blocks because you can see the beautiful prints on the fabrics so much better! Isn’t it a wonderful feeling to finish an old work-in-progress? great job, I love it! love the quilting too. So pretty! I love it all, the fabrics, the quilting, the binding. This is so beautiful and it has a lovely summery look to it. Love your choice of binding! Didn’t your friend do a great job with the quilting too!! I love it so much! The colors are really nice. My mom has done several of these turning twenty quilts. Maybe I need to make one too. You’ve inspired me. again. it’s totally lovely! and I don’t think you have issues about the throwing scraps away thing. You just must be a quilter at heart! 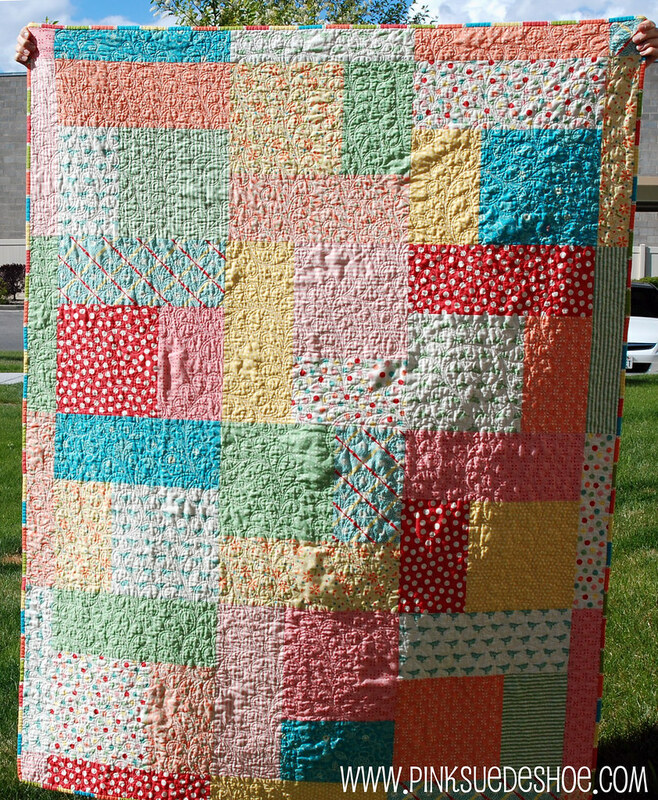 Great job choosing fabrics for this–the quilting really pulls it all together so beautifully. Your quilt turned out fantastic! What a great pattern. It has such a vintage look about it. Great fabrics. Enjoy the race. It’s such a great cause, and what a great event and bonding experience for Mother’s Day weekend! Very gorgeous! You did a fantastic job! And I love the quilting! What a fabulous quilt!! Love the bright and cheerful colors. You did a great job. And that quilting is amazing!! Your quilt is wonderful! Your friend did a fabulous job on the quilting. Love the binding you chose too.